NEW YORK (TheStreet) -- If you asked people to describe the face of the individual most tied to the idea of destroying capitalism you would evoke images of Karl Marx, Lenin or Fidel Castro, men of distinctive features and great bluster who made no secret of their disdain. Ask me and I see a man who is softly spoken, clean shaven, spares the bluster, lacks distinct or memorable features, although possesses a distinctive laugh and has greatly benefited from the system he is destroying. I see Jeff Bezos as the anti-capitalist who is methodically destroying the foundations that allowed the United States to thrive. First, let's acknowledge that Amazon (AMZN - Get Report) is an American success story. Financed by family funds and embracing technology as none had before, it survived an era that many did not and turned a concept into reality that has subsumed retailing, forcing retailers to create online shopping strategies. Amazon will report its earnings on Jan. 30. While I don't invest with items such as price/earnings ratio in mind, I know enough that Amazon's P/E of 1,414 puts to rest the derisive comments about it being a non-profit. But I also know no one believes in the axiom "we make it up in volume" more than Amazon, which had a 0.19% profit margin last year, compared to a sector average of 9.5%. Of 20 national retailers, only four had profit margins lower than Amazon: J.C. Penney (JCP - Get Report), Sears Holdings (SHLD, Best Buy (BBY - Get Report) and Aeropostale (ARO. That is precisely the problem. That is how Amazon is killing capitalism in its methodic march to eliminate competition, beginning with the already wounded. As John Maynard Keynes said, "The market can stay irrational longer than you can stay solvent." Bezos, though, isn't being irrational, as demonstrated by competitors that are slowly melting into irrelevancy. With size comes power, in this case pricing power, which to a degree has been supported by an asymmetric application of sales tax collection requirements. In essence, indirect government support undermining existing capitalist structure in support of a venture evolving toward a monopolistic or market controlling position. At a time when consumer discretionary spending doesn't appear to be consistent with an expanding and improving economy, price sensitivity remains an important motivator and Amazon maintains its advantage by aggressive pricing at the expense of margins. With over $70 billion in revenue it trails Wal-Mart (WMT - Get Report), but exceeds the combined revenue of Sears, J.C. Penney and Kohl's (KSS - Get Report), while matching Target's revenue. The latter two companies have scarce cushion in their profit and operating margins to withstand further erosion by an energized Amazon, ready to continue decreasing its margins, as it has done over the past three years. Don't get me wrong. I am a capitalist through and through and believe competition is what drives us forward, while other systems are left to the ash heaps of history along with the dodo. The same fate should befall businesses that simply can't compete on the basis of that blend of price and quality that appeals to varying segments of the population. Competing against Amazon, however, is somewhat like the Aztecs being faced with gunpowder-propelled projectiles. Admittedly, I shop Amazon and will probably continue doing so even as it increasingly loses the sales tax advantage it held over brick and mortar retailers. However, it is now that next phase -- as that artificial pricing advantage disappears -- that Amazon can only do one thing to maintain its position: It has to further reduce its profit margins. 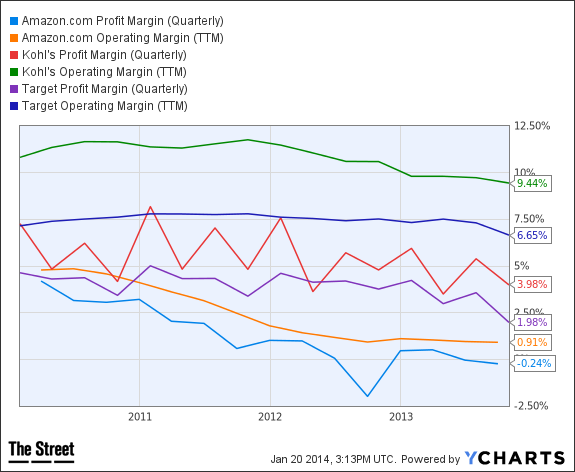 While Bezos may not be acting irrationally, investors may be accused of doing so, particularly in light of margins. Most any other retailing CEO would have been shown the door with performance such as Amazon delivers. However, it's share price that talks and you can't argue with a P/E of 1,414, except that it's 1,414. The realization that profits and return on equity are important concepts is currently suspended as there is implicit buy-in from investors that the strategy of driving the competition out of business is a sound one in anticipation of even greater share appreciation rewards. Clearly, the vision of near monopolistic existence has its perceived reward. While Amazon may not solely be to blame for the woes at J.C. Penney and Sears, it may not be entirely coincidental that J.C.Penney and Sears profit woes began in earnest at the time that Amazon's own profit margins began decreasing in 2011. Amazon is undoubtedly a contributor not just to those growing losses, but also to the degradation of the shopping experience as so graphically illustrated in a recent series of articles by Rocco Pendola. When you can no longer compete on the basis of price and are unable to generate sales revenue and cash flows, the only recourse remaining is to cut costs. Fewer employees, bare shelves and lack of facilities maintenance are the natural next stages -- as predictable as the "Five Stages of Grief," except there may be no end stage healthy resolution in sight. While Bezos is on a path that endangers capitalism, his continued success may really jeopardize Amazon's own shareholders whose fortunes are predicated on a model that history has shown can't be sustained. Eventually, profits and not promises are the engine that drive companies and their stocks. Sooner or later, cash flow is no substitute for profits. If you want to see capitalism saved, the answer is a plummeting Amazon share price and subsequent investor pressure to increase profit margins, restoring balance to the retail sector and giving the likes of J.C. Penney and Sears the ability to dodge those projectiles.